Jimmydog’s Chief Canine Officers Freddie and Joey have been on a roll, writing a short series of blogs about the all-important topic of dog walks. In the third and final installment of the miniseries, they speak directly to their canine friends about some matters of etiquette. We love the people who read our blogs, but right now we’d like to speak directly to the dogs in our audience about the very important topic of walking. Woof! Woof! As best we can tell, people don’t recognize the fact that it’s really the dogs taking them for a walk. They like to think they are the ones in charge. That’s fine. Let them believe that. But just because you’re actually the one in control of the walk doesn’t give you the right to be a jerk. 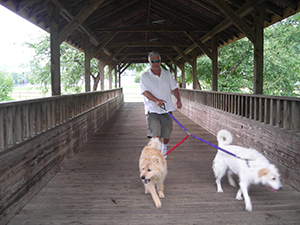 So, we wanted to give you a few tips for walking more happily with your pet parents. But before we get into that: A key purpose of any walk is catching up with the other dogs in your neighborhood or the regulars at your park, and we’ve got some ideas for doing that more effectively, too. To start with, make sure you get a big drink of water before you head out. You don’t know how long you might be walking. If you’re lucky, it will be a long, long time, maybe 42 days or—even better—27 minutes. (OK, so we’re not really good with time and clocks and calendars and stuff.) The point is, you want enough water in your system to be able to leave lots of messages for other dogs. We’ve all had the experience—usually near the end of the walk—of really wanting to add something to the conversation at the base of the crepe myrtle and discovering you don’t have anything to, uh, contribute. It’s the worst! Ask your person to carry extra water in case you need to fill up midway through your outing. But don’t overshare. Just because you’re hydrated enough to chime in on every dog discussion you happen upon, it doesn’t mean you have to. Sure, if you have a particularly clever retort to the schnauzer mix who stopped by the light pole a few hours ago, by all means, lift a leg. If you can add something to the ongoing discussion about how to win the Great Canine War Against Squirrels, take a squat. The key is to be judicious: You don’t want to get a reputation as a know-it-all. Added benefit: Without stopping at every bush, tree and fire hydrant, you cover more territory. * You’ll go farther if you stop pulling. This makes no sense to us, but pulling your person along on the walk does not, as you would expect, make you go more places faster. In fact, it can have the opposite effect. You know how it happens: You catch a whiff of a juicy groundhog up ahead and you take off, only to have your person stumble along, yelling at you to slow down. Sometimes they get so mad, they stop the walk early and take you home. Devastating! Sure, you can get an early start on your next nap and that’s always fun, but you’ve missed out on all sorts of outdoor adventures. Even worse, if you make a habit of pulling, your person might make you wear one of those ridiculous-looking halters or harnesses. Your person will tell you that you look cute in it. Trust us: You don’t. So, keep your cool. That juicy groundhog will still be there. We all know they don’t move that quickly anyway. * Heel—to keep them happy. Not all pet parents care about things like making you stop and sit before you cross every street or are obsessed with heeling—you know, that thing where, because of some insecurity deep inside themselves, they want you to walk right next to them at all times. But if your people are into these things, we recommend just going along and doing it. Throw them a bone, so to speak. It will make your people happy and, for that reason alone, it’s worth it. They do so much for you. After all, these are the same people who pick up your poop and carry it around in a little bag. Sure, as dogs, we enjoy sampling poop but we’re not going to carry it around the neighborhood in a baggie. That’s either a sign of love or craziness and we love our people too much to think they are crazy. So, heel. Sit. Do whatever they ask. Not to brag, but we are dog walk experts. We have gone on at least one walk every day for nearly our entire lives. We asked our people to help us figure out how many walks that is and it’s a big number: something like 3,800, which is way more than 4—the number of paws we each have, the number of creatures in our family pack and really the biggest number we ever needed to use before today. Most days, we have excellent walks. 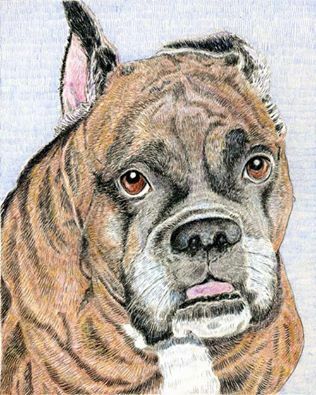 But some days, things go wrong and a lot of those times the things go wrong because of people—not because people are bad but because they don’t always understand dogs, even if they are pet parents of dogs themselves. So, we thought we’d explain some things from a dog’s perspective—’cause that’s the only one we have—that will make walks safer and more fun for everyone. The most important thing people should remember when they come across a dog out for a walk is that not all dogs are interested in meeting new people. We know this seems weird because of the whole “man’s best friend thing,” but some dogs are shy and some are just busy doing other things. As nice as you might be, if we are in mole-vole killing mode, we aren’t interested in making friends. We have exterminating to do! If you want to make friends with a dog, the polite—and safe—thing to do is to ask the dog’s person if it’s OK. And then you should listen for the person’s answer before you do any more things! We, for instance, often feel shy. We like people to say “hi” to us from a distance and then we all can go about our business. It can take a long, long time before we feel comfortable having new people pet us— like a couple of years. Seriously. Even if our person says it’s OK, watch us before you start petting our heads or offering us treats. If our ears are up, our heads are held high and our tails are wagging, we’re ready to mingle. If our ears are back, our fur is standing up, our tails are tucked under and our legs are stiff, we might be thinking about biting you. Hard. This is all especially important if you are one of those younger, smaller people called children—or if you are an adult who is responsible for children. Those younger, smaller people can be very cute and they are often covered in various crumbs and stains that are very, very tasty to dogs. But they also move erratically and sometimes screech in a way that really hurts our ears. One of our cousin dogs is terrified of all the younger, smaller people—and if those younger, smaller people happen to be playing with balls or riding on anything with wheels, he has a complete meltdown and his person has to take him home, where he has a nap to recover from the stress of it all. So, the next time you see us at the park, give us a big wave and say “hi” and we’ll wag our tails back at you—from a distance. Next up: The last part of our dog walking series—Dog walk etiquette—Lessons for dogs. Jimmydog wishes Todd a very happy birthday! This is what he and the chief canine officers wish they were doing today. Not quite warm enough yet – but soon! Meet beautiful Grace. 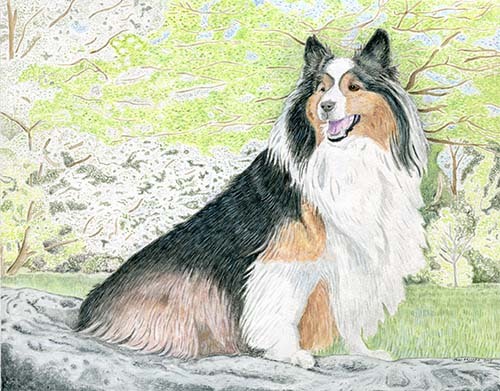 A gorgeous sheltie from Hickory, NC. A holiday gift from a loving sister-in-law. 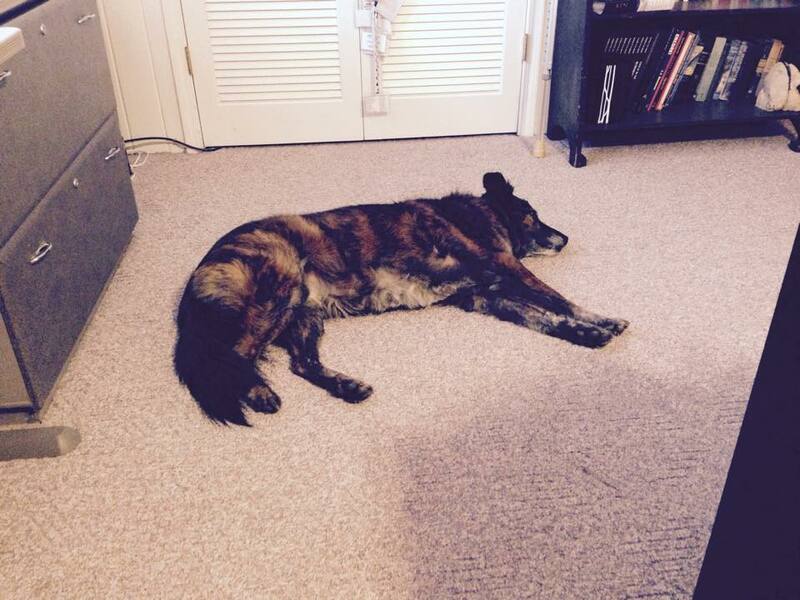 This week, Jimmydog is happy to welcome our God dog, Clooney as temporary floor manager. He’ll be keeping us all in line for the next couple of days. Walk this way! Walk every day! 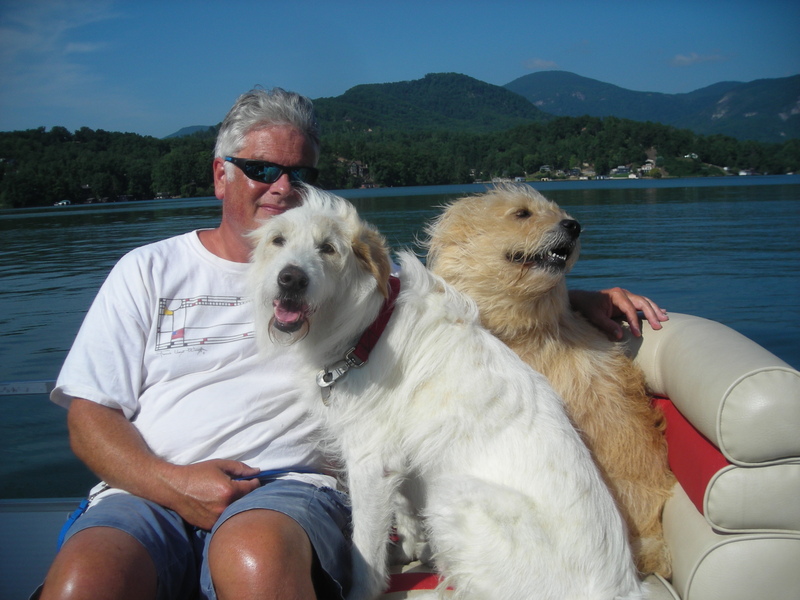 The third in a series of occasional blogs by Jimmydog’s Chief Canine Officers Freddie and Joey. 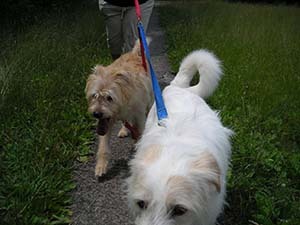 There’s almost nothing Jimmydog’s Chief Canine Officers Freddie and Joey love more than to go for a walk. In their latest blog or dlog as they call them, they explain the finer points of their daily habit (and they mean daily!) and encourage you and your dog to hit the trails, too! Never, in the history of dogs, has the answer to that question been no. It doesn’t matter if it’s really cold out. Or if it’s really hot out. It doesn’t matter if it’s raining. In fact, if it’s snowing, we like an extra-long walk. It doesn’t matter if our arthritis is acting up or we just got home from a 5-mile hike and could use a little nap. Do we want to go for a walk? Yes! Yes! Yes! As senior dogs, there are days when we don’t feel well enough for a very long walk. But even then, we WANT to go! Since we were mere pups, we have taken our person Todd Belcher for a walk every day—every single day—no matter what. (Have we mentioned that Todd is the best person ever?) When the weather is especially nice, we take a second walk. And if Stephanie—our other best person ever—has time, we take her along, too. Those are the best walks—when our whole pack goes together. We have heard that not all dogs go for a walk every day. We can’t believe this is true. It’s too sad to even consider. Our walks almost always start with our other favorite activity—riding in the car. We like to get out of the city and explore the walking and hiking trails of nice big parks in our county. Our favorites are Horizons Park and Triad Park. The car seems to decide which one we visit. (It’s bossy like that.) But that’s fine with us. We like the surprise. Oh, smell! We’re at Horizons today! Dogs are meant to walk. Our ancestors traveled long distances every day looking for food. Thankfully, as modern dogs, we don’t have to search for our next meal–it just appears in the bowl. Magic! Todd uses our walks to clear his head too. And when Stephanie comes, we talk about all sorts of important dog and people things. It’s a big family bonding time for all of us. As dogs, we’re actually quite chatty and leave a lot of messages for the other animals: “Stay away! This is my tree!” or “You smell cute. Leave me your address!” We don’t know why people waste time with all those Facetweets and Twitterbooks—pee is so much simpler.